Specialist rapid transit data Aspera falls into the hands of IBM. An acquisition may reshuffle the cards in the field of Cloud. 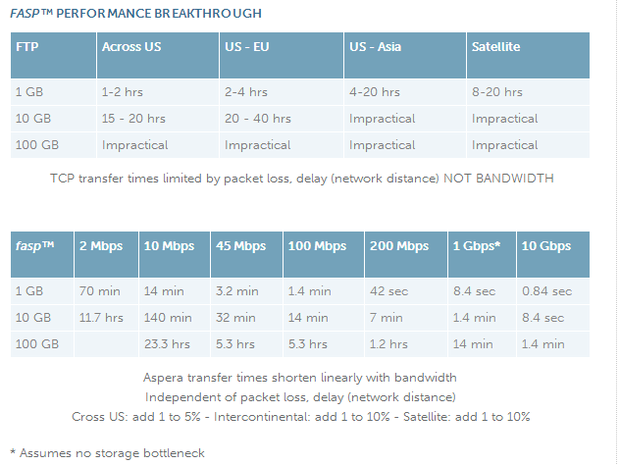 Founded in 2004 in California, Aspera is a company that has developed a protocol for fast data transfer while using the conventional Internet. Called FASP, this protocol is used by many companies, including film studio, who need speed to transfer large volumes of data. Netflix and Universal Studios are among the company's customers. In its press release announcing the acquisition, IBM talks about a movement towards the Big Data. But more broadly, it is likely that the Aspera technology is likely to recast largely supply IBM cloud with serious arguments. Indeed, the FASP protocol allows in some cases to accelerate transfers in more than impressive proportions. And a 24 GB file transfer between two continents which takes about 26 hours to be transmitted using FTP requires only 30 seconds for sending via FASP. Under these conditions, the performance because Netflix and some other services transfer videos are better apprehended. Since 2009, Aspera has also partnered with Amazon Web Services. We do not know today whether this partnership will continue. In the month of September, Aspera was presented a service file sharing and synchronization "to DropBox." Furthermore media companies, Aspera has developed widely in scientific organizations that handle and transfer large amounts of data in the context of their research. Total Aspera boasts 2,000 customers and 18,000 active licenses its software FASP already sold. In addition to the head office located in Emeryville, the company has representations in France, the United Kingdom and Singapore. The company was co-founded by Michelle Munson, current CEO and Serban Simu, Vice President Engineering. The amount of the transaction was not disclosed and IBM expects to close the acquisition in the first quarter of 2014. Our colleagues GigagOM had welcomed Ms. Munson in one of their conferences. You can watch the video below.